The chimney is a key part of a fireplace installation and a safe chimney is a must. For masonry chimneys Ash & Embers offer a full lining service for use with both gas and wood burning stove applications. Flue lining involves lowering either a single skin flexible liner for gas, or for solid fuel a twin-wall flue liner into the chimney. 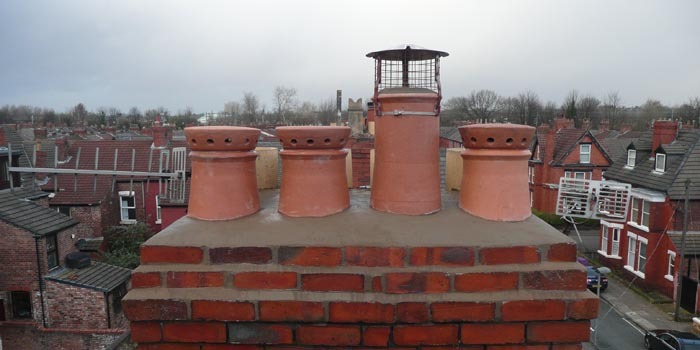 A lined chimney will then have a cowl or terminal fitted to ensure that rain and debris cannot run down the liner. Flue lining minimises the risk of leakage, will improve the performance of the fire and in the case of solid fuel minimise the risk of a chimney fire. Speak to us about your chimney if you are unsure of its condition. If no chimney exists it is normally possible to install a rigid steel insulated system, often without the need for any planning consent. This allows the home owner to have that gas appliance or wood burning stove installed almost anywhere in the house. The same system can be used to reinstate a chimney than has been removed at some point so that the room can regain its centrepiece fireplace.